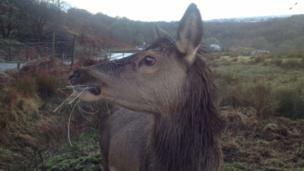 A selection of your pictures of Scotland sent in between 25 December to 2 January. David Blaney from Edinburgh sent in this picture of his wife Julia at the summit of Meall nan Tarmachan on Christmas day unsuitably dressed for mountaineering. 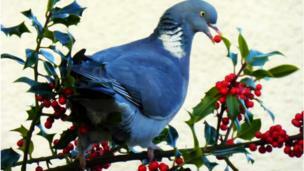 Eric Niven of Dundee says: "This wood pigeon was watching us having our Xmas dinner in Leven." 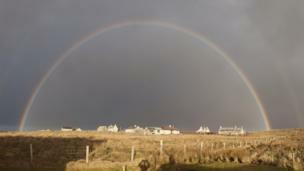 Rainbow on Christmas Day over Shawbost on the west side of the Isle of Lewis, taken by Charlie Green. 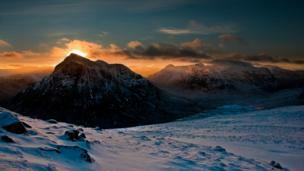 Sunset at Buachaille Etive Mor and Glencoe. 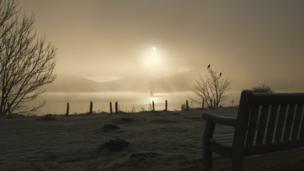 Taken by Mark Nesbitt from Comrie, Perthshire. 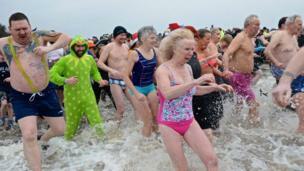 Believe it or not, this is frost. 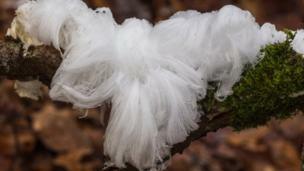 It is "frost flowers" or "feather frost", taken in Cawdor wood in Nairnshire on Boxing Day by Ian R Maxwell. 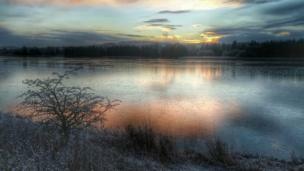 Philip Milne took this at a frozen Forfar Loch while out running the mince pies off on Saturday morning. 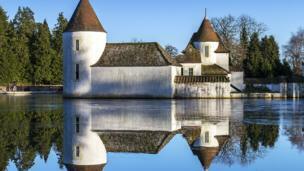 The boating lake - frozen in places - at Craigtoun Country Park, near St Andrews in Fife. Taken by William Starkey from Crook of Devon in Kinross-shire. 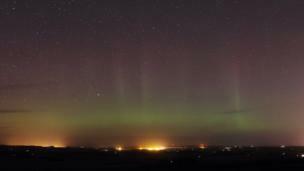 Alan C Tough took this auroral display on Christmas Eve just outside Elgin. 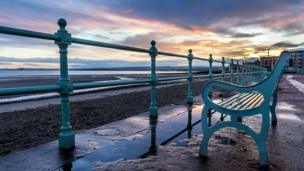 The sunrise at Portobello beach captured by Greg Urquhart. 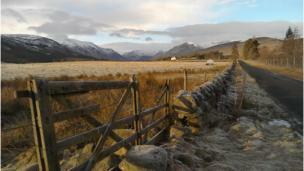 The light was just perfect in Glen Clova on Saturday, says Lesley Anderson from Dundee. 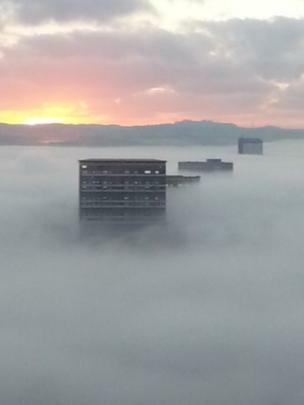 This photo of Glasgow flats in the mist was taken by Ricky Paterson from his mother's 18th-floor flat. 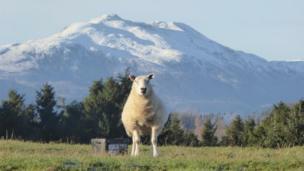 Angus Armstrong, from Dunblane, took this photo of a sheep against a snowy Ben Ledi on a Boxing Day walk near Doune. 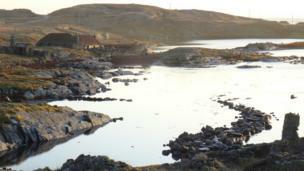 David Pitchford took this photo of traditional cottages on Berneray. 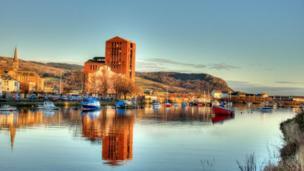 The River Leven flowing through Dumbarton on a beautiful winter's day. From Phil Dawson. 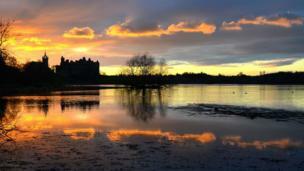 This stunning photo of the sun setting over Linlithgow Palace and loch was taken by Angus Laing. Janet MacLeod says: "Driving home from Glasgow to Oban we took a detour via Glencoe and I managed to get a few snaps from the car going at 60mph. Don't worry, my hubby was driving." 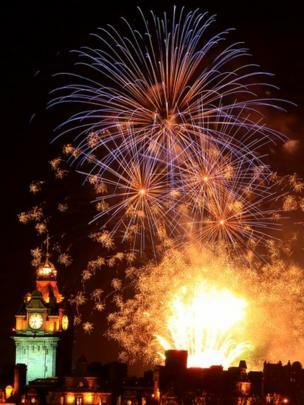 Renjith Thomas from Edinburgh took this photo of the fireworks during Edinburgh's torchlight procession. Keith Walker took this photo of a heron in Edinburgh's botanical gardens. 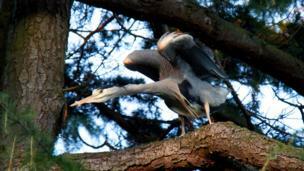 "There were two heron in the same tree catching the last of the sun as it set," he says. 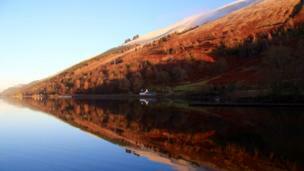 Calm reflections by Loch Lochy, taken by Bill Cameron. 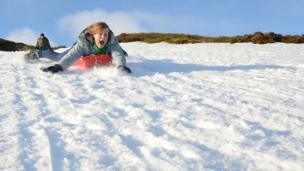 Sledging at Meall Nan Tarmachan. 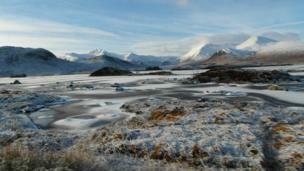 Photo taken by Richard Nettleton from Edinburgh. The Caledonian Canal basin at Corpach, Fort William, looking over Loch Linnhe. 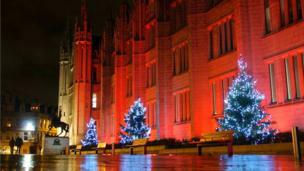 Photo by Kenneth Knox from Glasgow. 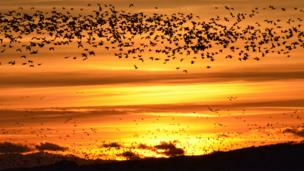 Thousands of Barnacle Geese seeking a roost for the night at sunset at Caerlaverock near Dumfries. 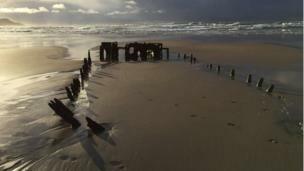 Taken by Mick Welsh. 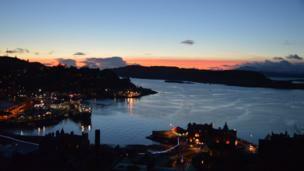 Winter sunset over Oban bay taken from McCaigs tower by Andrea MacKechnie. 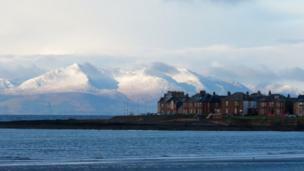 Arran's snow-covered hills provided a dramatic backdrop for a walk on Troon Beach says Fiona Ballantyne from Edinburgh.